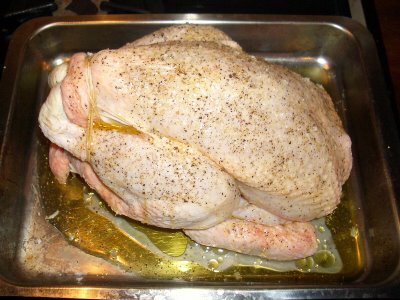 Roast chicken for dinner tonight. Oh yes bring it on! As you can guess I LOVE roast chicken. It’s got to be in the Top 5 and its probably right on up there at the number one slot. Soooooo delicious whatever you pair it with. And the all time favourite choice of birthday treat dish for me as a kid. Of course my grandma cooked a really top-notch roast chicken and trimmings – but who’s Gran didn’t (and no way would you admit to it if they didn’t hey)? And, even though I say so myself, I think she passed on some of that skill onto me (quite how I don’t know because we never cooked roast chicken together – scones maybe but not a roast); it must be in the genes. Tonight’s chicken is ORGANIC (more about this in a later post). 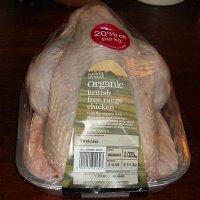 So we’ll be making it last quite a few meals and that’s part of the joy of a roast chicken, how far can you stretch it – keep checking back this week to find out what we do with it all (its 4.5lb and there’s only two of us). 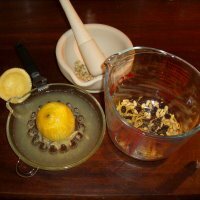 I’ve stuffed it with some parboiled basmati rice mixed with lemon zest, crushed coriander seeds, chilli flakes, pine nuts and a few sultanas (inspired by recipes in The Legendary Cuisine of Persia). It’s been drizzled with lemon juice and olive oil (or possibly drenched in the case of the latter – oops) and sprinkled with black pepper and Maldon salt. Now that’s what I call oven ready chicken. I’ve been thinking about my favourite foods recently, listing, considering, adding, subtracting, juggling, testing…….although I’ve not quite got to my top 5 just yet I’m getting close. But one thing that has just got to be on there is MUSHROOMS. I love them in all their different guises. From elegant looking oysters to hearty portobellos and every stop in between, they are a (very) regular feature of my cooking. Stews, stir fries, omelette, risotto, pasta and fry ups. 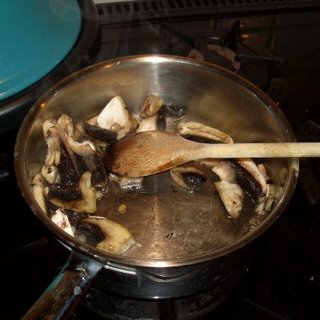 And here are some big fat organic field mushrooms cut into generous sized chunks being sauteed in butter – wonderful, wonderful, wonderful.